Manson, Sinatra and Me is a Hollywood party girl's memoir that details her encounters with former Presidents, Senators, Congressmen, foreign dignitaries, celebrities, sports stars, businessmen - you name it - including the likes of Frank Sinatra and other members of the Rat Pack. The average man or woman may not have heard of Virginia Graham, but everybody in the know was aware of what her game was as a key player in the Hollywood Screw System. When Virginia found herself in trouble with the law, she ended up in jail. Yet somehow she continued to meet interesting people - like Susan Atkins, her cellmate, who confessed to Virginia about how she had butchered Sharon Tate and her unborn child. Atkins also told how she and her friends, all members of the Manson Family, were involved in what has become known as the Tate/LaBianca murders. Virginia reveals the true story behind Susan Atkins' prison confession about the Manson Murders, what led to her becoming a key witness for District Attorney Vincent Bugliosi in the Helter Skelter case, and why she went into hiding after the trial ended. Virginia's testimony helped save the lives of many Hollywood celebrities, and she received recognition from Elizabeth Taylor for doing so. Virginia Graham was in the Sybil Brand Institute for Women in California when Susan Atkins was jailed for the murder of Gary Hinman. Susan befriended Virginia and eventually confessed about the Tate/LaBianca murders. In Manson, Sinatra and Me, Graham details her own life as a Hollywood party girl during both the good times and the bad, her encounters with Atkins, as well as the Tate/Labianca murder trial as a key witness for the prosecution that was tried and won by District Attorney Vincent Bugliosi. I took the liberty of making a few changes/updates. $20 for the book, and $10 for the kindle version. "Virginia Graham had a heck of a run in her life as a party girl, and has told of her rollicking story very well in this poignant and sometimes very funny memoir of hers. She also happened to be a star witness of mine in helping me bring the Manson Family killers to justice, something for which I will always be very grateful to her." Is this a new version of "Joy of Hooking? It may very well be, a newer version of Graham's "Joy of Hooking"... because the description for Graham's original book ("The Joy of Hooking") is on Cielodrive.com, and it's pretty damn close to verbatim (to this "new" book on Amazon)... and moreover, both books are distributed by the same publisher (i.e., "Zebra Publications"). Also, Graham's original book has 280 pages... and this "new" book has 256. (Not that it really matters... because of course, this could simply be a shorter (edited) version of the same book). Your guess, is as good as mine. I don't know anything about this book, I just saw that it was for sale. 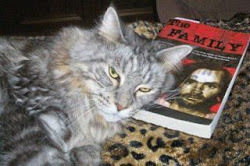 But it can't be worse than the pointless drivel that is churned out by countless authors who write books every year who claim they know "THE TRUTH" because they (1) spoke to Manson, or (2) they spoke to a "secret nameless source", or (3) they figured out Tex was lying, or (4) they claim all the victims are drug dealers, or (5) (and this is my favorite) it was all done as copy cat murders to get Bobby out of jail. I won't personally buy this book, but if someone else wants a few chuckles to ease their pain, have at it. Hi Beauders! Speaking of books, how is yours coming along?? Hi Marliese! I think Susan Atkins had 2 channels. The crazy one (Sadie) and the sane one (Susan). I think we saw Susan at the parole hearings, soft spoken, sweet and contrite, but I think Sadie still lived there too. You can tell from her pictures during her time in prison. It's interesting to think about because I think "Susan" hated "Sadie" but she never really ridded herself of her other self. That makes perfect sense. I haven't thought of her that way, but now that you mention it...makes good sense. But aside from her pretty and not so pretty facial expressions, you're right, there was soft spoken, contrite Susan, and then there were flashes of spooky Susan here and there...at least in some photos we see through the years. Thanks Marliese. I think that Susan was a scared young girl, singing in the church choir, afraid that her mother would die, which she did, and afraid that her Daddy would bail, which he did. Then she met the Devil himself, Manson. Which was her downfall. The books pretty well done, just some tweaking needed. I need a publisher or help self publishing. I'm afraid of getting sued. Maybe when Manson dies something will happen. If it does I plan on writing an encyclopedia on Jonestown, which was my first love of my 'odd' subjects (Jonestown, the Holocaust, Manson). Wasn't the celebrity hit list fake? Didn't Ronnie Howard say Virginia fabricated it? "It's obvious they are guilty, let's spice it up." Cuntry, I thought Susan made the celebrity hit list up?? Beauders said: Maybe when Manson dies something will happen. Why does everyone say that? What will happen? The Jonestown book would be interesting. More mayhem for no reason at all, except a maniacal cult leader goes haywire. But it can't be worse than the pointless drivel that is churned out by countless authors who write books every year who claim they know "THE TRUTH"
Don't you believe it. It not only could be worse, it is ! It's a pretty crummy book.